"The Award recognises the organization’s innovative initiative to address the critical issue of health care through a cooperative health insurance scheme for farmers at affordable costs. In a short span of two years since its inception, this scheme showcase a form of public private partnership to meet the health care needs of the lower showcases a form of public private partnership to meet the health care needs of the lower socio-economic strata within a cooperative social framework. This scheme, which is the largest of its kind in India, is a statement of the collective power of the farmers to meet a need where most systems had feared to tread. While preserving the dignity of the patient, the scheme gives credibility to the health care system. Narayana of society with inter-organisational partnerships". 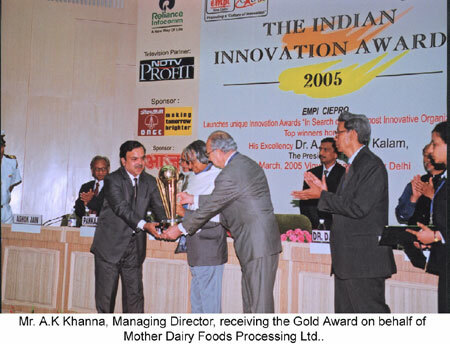 "For its innovation in the food chain through milk distribution by bulk vending system and for bringing about a major change in the supply chain for fruits and vegetables. With its origins as being the front end of farmers’ cooperatives Mother Dairy operates today the largest liquid milk plant in Asia. Extending the success in milk, Mother Dairy Food Processing Ltd has gone ahead to further expand and strengthen linkages between the rural farmer and the urban consumer in the fruits and vegetables with SAFAL. Its successful efforts in far-flung areas of the nation are noteworthy. The organisation stands out as an example of innovation in design, organisation, cleanliness and efficiency and has become a household name". 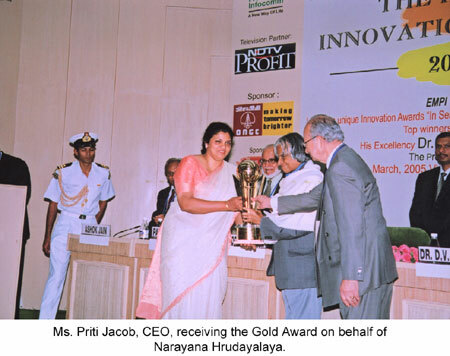 "For its innovative programmes in rural development, panchayati raj and local communication action. With its origins going back to the inspiring ideas of Mahatma Gandhi, their multi-disciplinary programmes have succeeded in providing livelihood to small and poor farmers in arid and hilly regions with forage production on degraded land with introduction of silviculture, water resource development and agri-horti-forestry. The scale of benefits accruing through its efforts, the range of Areas covered and the extension of its programmes to parts of the country beyond their base are truly impressive, as also the efforts to meet the changing resources scenario of regions where known approaches had little chance of succeeding. 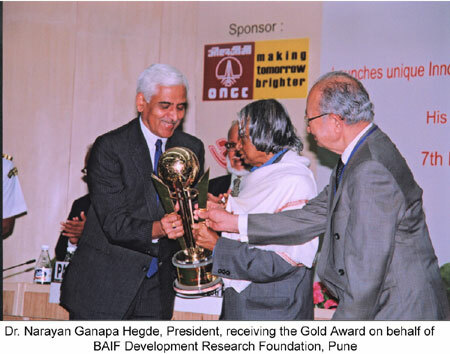 BAIF Development Research Foundation has emerged as an exemplary organisation with a culture of continous innovation in the area of poverty eradication and rural development". "In recognition of its wide ranging innovations in projects related to development of infrastructure on a commercial format. Working on diverse projects in sectors of transportation, water supply and sanitation, social infrastructure, new convergent media center, and environment, the I.L. & F.S. has worked through Public – Private Partnerships to create high impact, replicable models for other infrastructure agencies to follow". 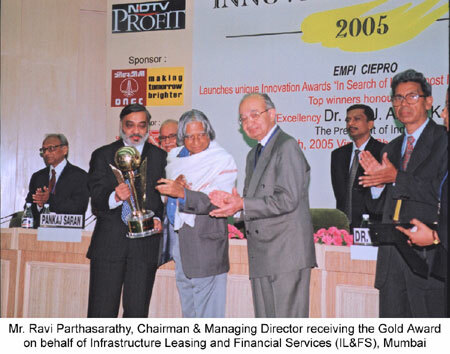 "A highly innovative organisation for governance of the capital market in India, it has transformed the face of financial trading in the country and that of India in the global trading community. Its automated trading system has shifted the trading platform the trading halls to computer terminals spread across the country. 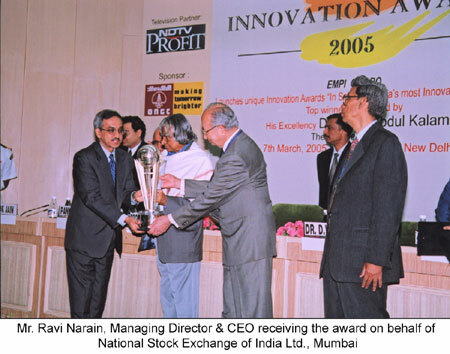 NSE has been a catalyst of change, playing a leading role in market reforms and in evolving best market practices. It is one of the largest exchanges in the world in terms of financial trading". "For their innovative multi purpose model of ICT kiosks, especially in hitherto relatively ignored rural and semi urban regions of India. AISECT model integrates ICT supported services, covering various sectors of social and economic development, with education, and training in and maintenance. It has provided new self employment opportunities to local populations in the form of micro enterprises for ICT based services and electronic and electrical repair and maintenance work. 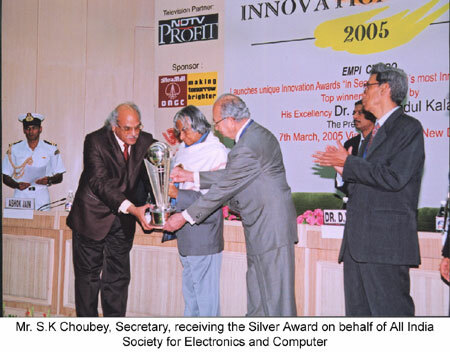 AISECT has emerged as the largest all India network of semi urban and rural ICT centres. The wide spread diffusion of AISEC model kiosks is good indicator of its viability to spread even further, thereby contributing the digital divide". 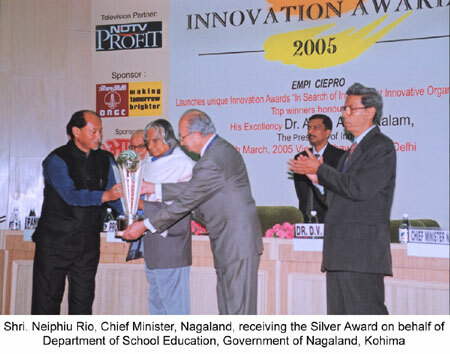 "For its pioneering public initiative of empowering the community through the Nagaland Communitisation of Public Institutions and Services Act 2002. Its successful implementation by the Department of School Education, Government of Nagaland is a prime example of revitalisation of the age-old tradition and practice of community participation to meet the contemporary needs of society. Communitisation of programmes has enabled community at the grass-root level to share as well as own responsibility in the creation and management of governance systems from education to health and power distribution".